Latvian and Lithuanian science fans! Have you ever tried to extract DNA like a real CSI expert or proceed a real eye surgery? What it takes to create sound with pipes and straws or survive the bed of nails? Do you know, what is inside your body or have you seen the world upside-down? Is it possible to make air visible or turn fire into green? All these and even more questions are answered in AHHAA’s tour Science on Wheels! 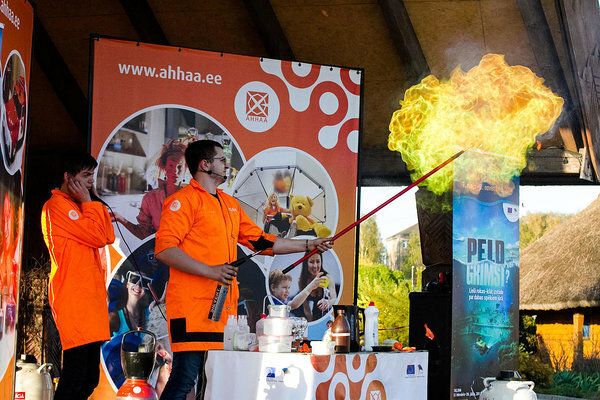 The tour exhibition will stop in Vilnius, Kaunas, Klaipeda, Ventspils, Jelgava and Daugavpils, where all visitors are greeted by numerous hands-on exhibits, exciting workshops and thrilling science theatre shows! Programme is held in English, Russian and Latvian and it is all free! Photo taken during the tour in Latvia, 2015.